Sick And Tired Of Walking Into A Room And Forgetting Why You Went In There In The First Place? How about forgetting where you left your car keys or reading glasses? Can’t remember names – maybe even of close friends and family members! If you think these are normal signs of aging – and you’ll just have to live with them – THINK AGAIN! Some of the most potent recall-supporting nutrients are found in optimal synergistic amounts within Neuro-Natural Recall. Two ingredients found in Neuro-Natural Recall warrant a special mention; namely Vinpocetine extracted from the leaves of the lesser periwinkle plant, and Huperzine A which has been extracted from a special kind of moss…both ingredients are from natural sources. BUT…what other nutrients do you need? Neuro-Natural Recall also includes adaptogens which are important for supporting healthy neurotransmitter function. Two of them…Eleuthero and Schisandra...are included in the formula along with another 37 active ingredients and co-factors…each with their own role to play as well as enhancing the efficacy of their ‘companion’ nutrients. Neuro-Natural Recall is a state-of-the-art supplement, using exceptional ingredients specifically combined to work together, and representing exceptional value for money. It may be taken alone or for the best possible results combine it with Total Balance and Omega 3/DHA Fish Oil. Help optimize your recall and reduce the risk of cognitive decline with Neuro-Natural Recall! Other Ingredients: Microcrystalline Cellulose, Enteric Coating (Purified Water, Ethylcellulose, Ammonium Hydroxide, Medium Chain Triglycerides, Oleic Acid, Sodium Carboxymethyl Cellulose, Talc, Polydextrose), Dextrose, Silicon Dioxide, Magnesium Stearate, Dicalcium Phosphate, Maltodextrin. Daily Serving: Adults - 6 tablets. Age 16 to 18 years – 4 tablets. Age 12 to 15 years – 3 tablets. Age 10 to 11 – 2 tablets. For optimal results split into 2 doses per day; first thing in the morning, and later in the day. Take with or without food. Can be taken with any other Neuro-Natural product for a full dose of 6 tablets a day (E.g. 3 tablets of Neuro-Natural Recall with 3 tablets of Neuro-Natural Serenity). 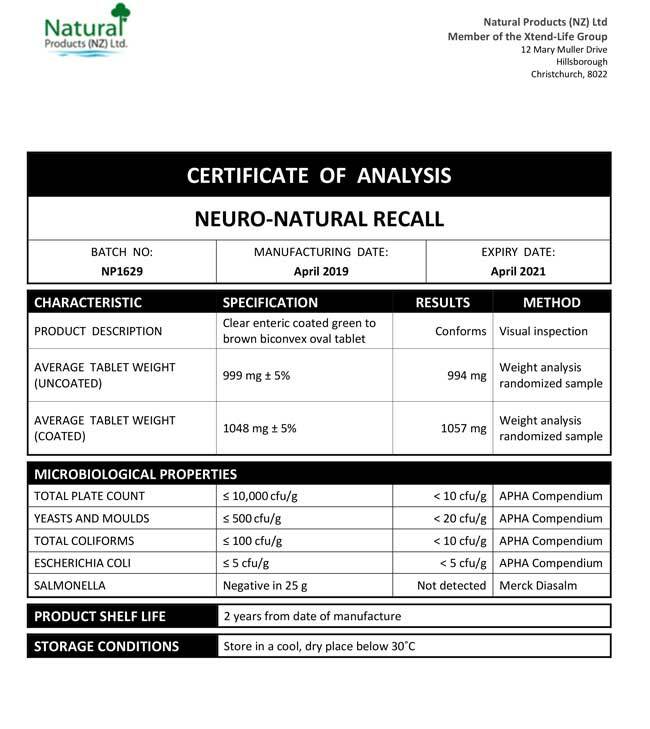 We have included below a copy of a typical Certificate of Analysis (CoA) for our Neuro-Natural Recall product. All of the Xtend-Life Neuro-Natural Recall products have the same formulation and standards. What benefits could I notice from using Neuro-Natural Recall? Neuro-Natural Recall is designed to specifically help improve concentration and support short-term memory recall, helping to rejuvenate the brain cells. You may well see improvements during times when enhanced concentration, clarity of thought and recall are required. What is the recommended dosage for Xtend-Life Neuro-Natural Recall? Can be taken with any other Neuro-Natural product for a full dose of 6 tablets a day (E.g. 3 tablets of Neuro-Natural Recall with 3 tablets of Neuro-Natural Serenity). Combines well with our Omega 3 Fish Oil products, Total Balance and Kiwi-Klenz. How do I get the best results from Neuro-Natural Recall? To see the best and most rapid results we suggest that you follow our 'recommended dosage' suggestions, along with plenty of mental stimulation and adequate physical exercise. To give your memory a boost and help improve the clarity of thinking, Neuro-Natural Recall is certainly a good first choice. Ideally, this should be combined with 2 soft gels per day of one of the options in our Omega 3/DHA Fish Oil. If you are looking for optimum brain health support as well as other benefits, add a full dose of Total Balance to this regime. I already use Omega 3 fish oil for my memory so do I need to use Neuro-Natural Recall as well? Omega 3 fish oil extracts may help support memory recall and brain function, in children and adults, which is why it is a commonly recommended product to address these concerns. However, to offer a more comprehensive protocol we would highly recommend adding Neuro-Natural Recall as well. Neuro-Natural Recall contains specific ingredients to support neurotransmitter function. This is a specific formula for this area of health and its related conditions, as well as general nervous system and neurological support. Some of the ingredients in our range are very special components. Most companies leave these ingredients out due to their expense and the fact that some of the more vulnerable nutrients must be enteric coated in order to make it through the stomach acid to be successfully absorbed in the upper intestine. An excellent example is SAMe. SAMe plays an essential role in more than 100 biochemical reactions involved in the methylation process of various vitamins such as B6, B12, folic acid, and betaine. It contributes to the synthesis, activation and metabolism of hormones, neurotransmitters, nucleic acids, proteins, and phospholipids. Neuro-Natural Recall has the advantage not only of having these ingredients included, but it is also enteric coated. This ensures that the vulnerable ingredients stay intact too, and are optimally absorbed in the upper intestine. Yes, it is very possible you will notice a difference. Loss of concentration can affect us all, whether young or old. Neuro-Natural Recall works with our natural neurological balance to support clear recall and clarity of thought. If you refer to the ingredients list you will be able to find out more about how these individual ingredients work together in order to help support your recall and function. It is important to make sure you keep mentally stimulated throughout your life. The old adage "if you don't use it, you lose it" is very true. Just like our muscles, which will grow weak and atrophy without use, our brain needs just as much stimulation to keep fit and healthy. So try to do things that will keep your mind busy and make you think, as well as things that will make the creative side of your brain exercise too, such as painting, for example. A healthy and balanced diet is, of course, important to ensure your brain and the entire neurological system is getting all the essential nutrition it needs to maintain this stimulation. Why should I select Neuro-Natural Recall over the other three versions in the range? Neuro-Natural Recall concentrates specifically on supporting brain function and memory recall. This product is a good choice for those requiring extra cognitive support due to a mentally demanding job or during study to enhance memory. It is especially recommended for use as an Alzheimer's preventative and to protect against memory decline that may occur with aging. Can I take more than one product in the Neuro-Natural range at a time? What makes Neuro-Natural different from similar supplements on the market? The Neuro-Natural range is a sophisticated and complex supplement containing 49 ingredients, specifically dosed to ensure each works well in harmony with another for the best results. It is designed to be used on a long-term basis, rather than in the short-term like some other less complex, single ingredient products on the market. We are proud to utilize a number of unique ingredients in Neuro-Natural. Most supplement companies leave these ingredients out partly due to their expense. Another factor is that some of the more vulnerable nutrients must be enteric coated so they are not damaged by the stomach acid and can be effectively absorbed. Many companies do not invest the time or finances to enteric coat their products. A good example of this is SAMe, which plays an essential role in more than 100 biochemical reactions involved in the methylation process of various vitamins such as B6, B12, folic acid, and Betaine. It contributes to the synthesis, activation and metabolism of hormones, neurotransmitters, nucleic acids, proteins, and phospholipids and is therefore very valuable ingredient. Neuro-Natural has the advantage of specialist ingredients such as SAMe, plus the benefits delivered from the enteric coating which supports the optimal absorption in the upper intestine.